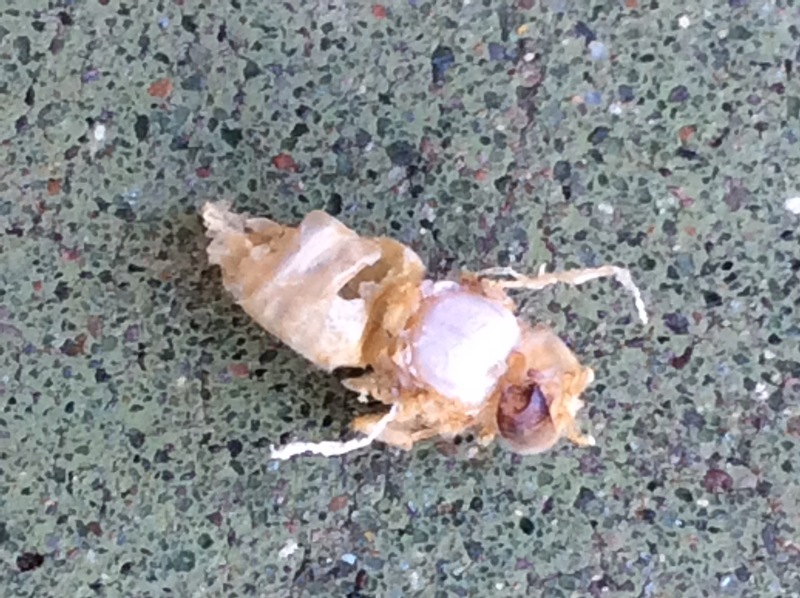 Straight out of a Survivor episode, the past few days my girls have been industriously throwing out bee embryos. At first I panicked. Then as I read more about the possible causes of dead white embryos all around the entrance, I realized that they were thinking ahead and most likely exercising bee wisdom. B) the queen needs to be replaced. Since Fall is imminent and I am leaving town, I placed the drone comb near the back of the hive and hoped that they girls would forget about the guys. It’s never a good sign to find drone brood, especially as winter approaches. Well, evidently they didn’t forget about them, they threw them out of their developing nests. To reduce mouths to feed as winter approaches and temperatures plummet at night and nectar is at a premium, the girls took things into their own hands. Sadly, the drones had arms flailing as though they tried to resist in their half formed state, but to no avail. Nature has a cruel streak. Survival of the fittest. Somehow it seems like an apt metaphor for our political culture these days. It seems that this country has turned to a survivalist mode. We are ready to oust people of color, people of other languages, cultures, religions and lack of the proper documents from our shores—it doesn’t matter that they do the lowliest service jobs that people in this country won’t touch. It doesn’t matter that most people at our doorstep are here because of U.S. wars abroad and trade policies that have devastated their country’s economies. No kidding. Certain segments of our culture are turning to nationalism and a rising white supremacy to ensure that those who feel threatened become powerful again. The fact that when the most vulnerable are lifted up, all of us are lifted up, seems to be lost on a society hungry to be “great again”. Quite frankly, it’s the ones who are most threatened that probably feel the most vulnerable. As humans, we can do better than this. Being great again means making sure everyone has a job, eats, is raised out of poverty and has a fair chance to be educated. It means that gun violence is eradicated so elementary children don’t die when they go to school one day. It means linking our independence to interdependence—with the natural world around us and all the peoples of the world who are no different than citizens of this country in our hopes and dreams. The bees will downsize with a policy that may lead to their survival as a hive, but it will not ensure that all survive. As humans, we can do better. This time, I say let’s “think better than a bee”.